First, a quiz question which should defeat even the most knowledgeable chess enthusiast. 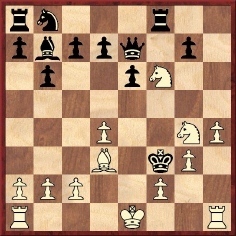 Name the player who, in the above position, sacrificed his queen with 11 Qxh7+. Edward Lasker is the obvious reply, since his brilliancy against George Thomas is one of the most celebrated games in chess literature, but the correct answer is K.S. Kibbey, against D.F. Dorman. Their encounter went 1 d4 f5 2 Nf3 e6 3 Nc3 Nf6 4 Bg5 Be7 5 Bxf6 Bxf6 6 e4 fxe4 7 Nxe4 O-O 8 Bd3 Kh8 9 Ne5 b6 10 Qh5 Bb7 11 Qxh7+ Kxh7 12 Nxf6+ Kh6 13 Neg4+ Kg5 14 f4+ Kh4 15 g3+ Kh3 16 Bf1+ Bg2 17 Nf2 mate, according to page 176 of Chess Review, August-September 1942. Presenting the game, Fred Reinfeld remarked, ‘there is nothing new under the sun’, by which he was, of course, referring to the Lasker v Thomas precedent. 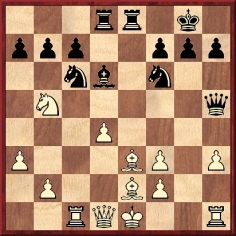 That game, though, did not reach the position in the above diagram, since Thomas moved his queen to e7 and did not play his king to h8. In addition, version 4 appeared not only in Deutsches Wochenschach, 8 December 1912, page 440, and the Deutsche Schachzeitung, January 1913, pages 6-7, but also in R. Loman’s column in De Amsterdammer, 17 November 1912. In short, Lasker himself was responsible for so many mistakes and self-contradictions in his accounts of the game that it is hardly surprising that numerous other writers have misreported it too. Pages 163-164 of How to Win in the Middle Game of Chess by I.A. 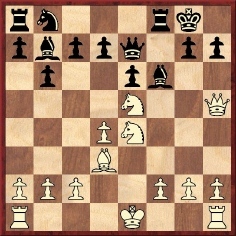 Horowitz (New York, 1955) stated that the game was played in 1915, claimed that the opening moves were 1 d4 e6 2 Nf3 f5 3 Nc3 Nf6, did not mention the faster mates and had as the mating move not 18 Kd2 but 18 O-O-O. 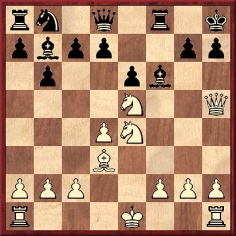 Mate by castling was also given in the score (which began 1 d4 e6 2 Nf3 f5 3 Nc3 Nf6 4 Bg5 Be7 5 Bxf6 Bxf6 6 e4 fxe4 7 Nxe4 b6 8 Ne5 O-O 9 Bd3 Bb7) presented on page 234 of the Chess Amateur, May 1913, courtesy of Magyar Sakkvilág. On page 25 of The Daily Telegraph Chess Puzzles (London, 1995) David Norwood offered a wrong date (1910) and the wrong circumstances (it was not a ‘blitz game’), and on page 33 he did not mention the faster mates that Lasker missed. It was also described as a ‘blitz game’ on pages 88-89 of Queen Sacrifice by I. Neishtadt (Oxford, 1991), which dated it 1911. 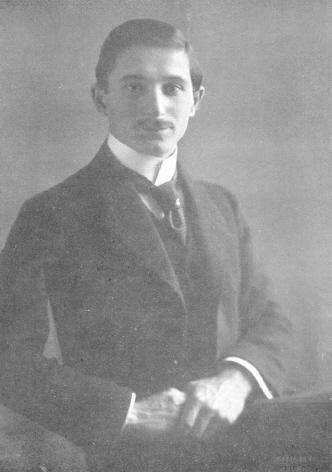 In contrast, 1913/1914 was the information on page 89 of Şah Cartea de Aur by Constantin Ştefaniu (Bucharest, 1982). 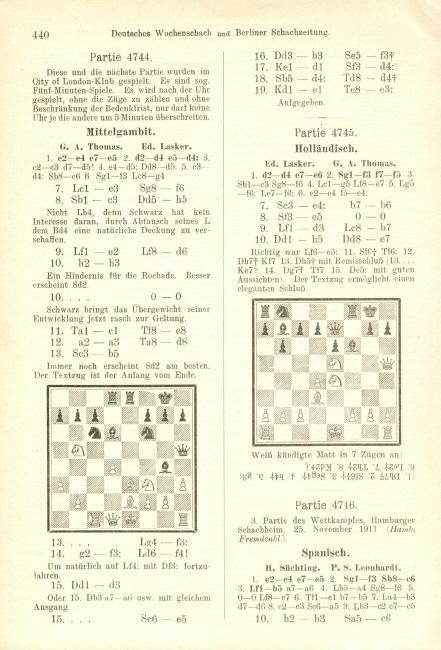 Page 28 of 666 Kurzpartien by Kurt Richter (Berlin-Frohnau, 1966) dated the game 1921 and called Black ‘Sir Thomas’. 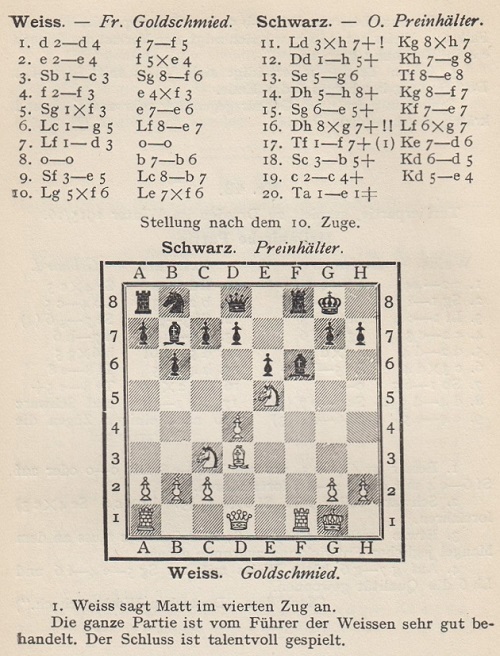 On page 115 (printed as page 11) of Der Weg zur Meisterschaft (Berlin and Leipzig, 1919) Franz Gutmayer gave the conclusion as 11 Qxh7+ Kxh7 12 Nxf6+ Kh8 13 Ng6 mate. It was played by Ed. Lasker and George Thomas at the City of London Chess Club in late 1912. It was an informal game in which neither player could at any point exceed his opponent’s time by more than five minutes. Lasker’s mating move was 18 Kd2 and not 18 O-O-O. 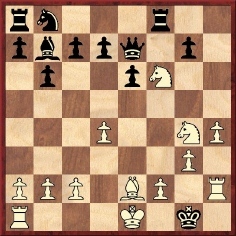 The most likely order of the opening moves is version 4 (the earliest sources) in the list above, which would give this complete game-score: 1 d4 e6 2 Nf3 f5 3 Nc3 Nf6 4 Bg5 Be7 5 Bxf6 Bxf6 6 e4 fxe4 7 Nxe4 b6 8 Ne5 O-O 9 Bd3 Bb7 10 Qh5 Qe7 11 Qxh7+ Kxh7 12 Nxf6+ Kh6 13 Neg4+ Kg5 14 h4+ Kf4 15 g3+ Kf3 16 Be2+ Kg2 17 Rh2+ Kg1 18 Kd2 mate. 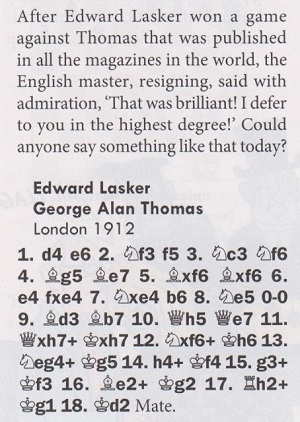 Although the game is familiarly referred to as ‘Edward Lasker v Sir George Thomas’, such a heading would be impossible in a contemporary source, since Eduard Lasker had yet to become Edward, and George Thomas was not yet a baronet. 14…Bf4 15 Qd3 Ne5 16 Qb3 Nxf3+ 17 Kd1 Nxd4 18 Nxd4 Rxd4+ 19 Ke1 Rxe3 20 White resigns. Source: Deutsches Wochenschach, 8 December 1912, page 440. Reverting to the queen-sacrifice game, published on the same page, we add a further discrepancy: after 10...Qe7 Lasker is said by the German magazine to have announced mate in seven (although the line comprised eight moves). 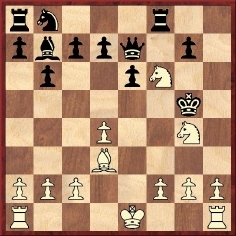 Page 100 of Schnell Matt by Claudius Hüther (Munich, 1913), the first book in which we have found the brilliancy, stated that after 10...Qe7 White announced mate in eight moves. Later, the game was even attributed to Emanuel Lasker (versus an unnamed opponent). 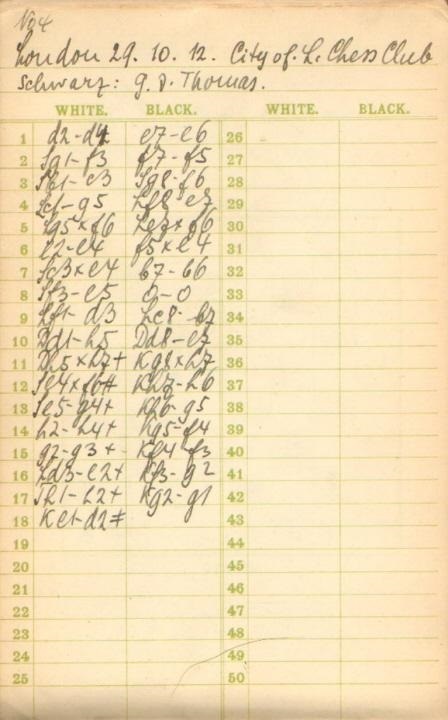 See, for instance, page 85 of Emanuel Lasker Volume 3 by K. Whyld (Nottingham, 1976); the game (11 Qxh7+ Resigns) was taken from Els Escacs a Catalunya. 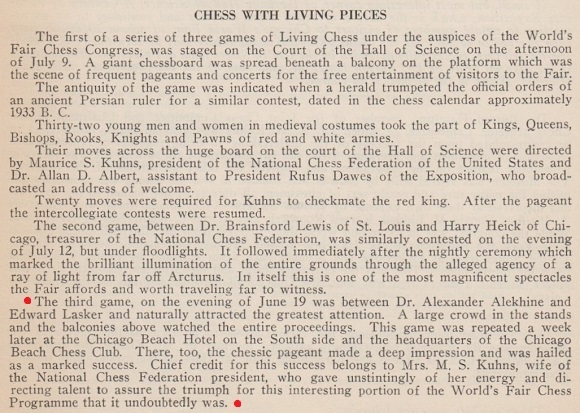 The game was given as ‘an old-time Lasker gem’ (Emanuel Lasker was implied) on page 60 of CHESS, January 1941 (‘Lasker v Thompson’). A correction appeared on page 71 of the February 1941 issue. On page 261 of its October 1941 issue the BCM corrected itself regarding the date of the Ed. Lasker game (1912, not 1913), but on a far more important point the magazine remained oblivious: no such game-score appeared in Lasker’s Manual. A similar remark about Emanuel Lasker having previously played the game was made by the BCM editor, Julius du Mont, on page 240 of his book 200 Miniature Games of Chess (London, 1941), but we are aware of no dependable evidence that Emanuel Lasker ever played a game identical or similar to the Ed. Lasker v G. Thomas one. There are, though, still writers who believe that Lasker v Thomas, London, 1912 was played by Emanuel Lasker. See, for instance, pages 92-93 of Iniciação ao Xadrez by A.L. Manzano and J.S. Vila (Porto Alegre, 2002). C.N. 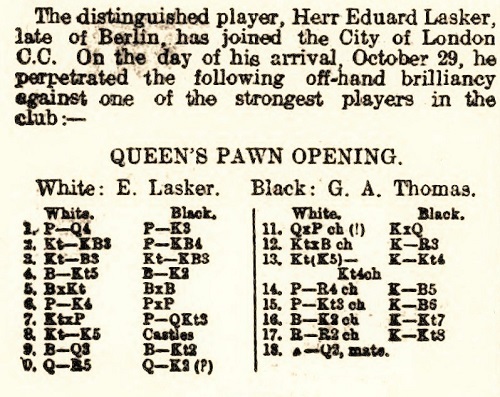 5172 reported that Lasker also published the game on pages 216-217 of the second edition of his book Schachstrategie (Leipzig, 1914). Remarkably, that yields a ninth version of the first nine moves: 1 d4 f5 2 Nf3 e6 3 Nc3 Nf6 4 Bg5 Be7 5 Bxf6 Bxf6 6 e4 fxe4 7 Nxe4 b6 8 Ne5 O-O 9 Bd3 Bb7. Frederick S. Rhine (Park Ridge, IL, USA) notes that on page 29 of Chess Techniques by A.R.B. Thomas (London, 1975) the conclusion was given as 16 Be2+ Kg2 17 O-O-O Resigns. As previously noted, many writers have stated that Lasker castled on move 18, but is A.R.B. Thomas alone in suggesting that 17 O-O-O was played? It will be seen that the move-order on this score-sheet, which dates the game 29 October 1912, does indeed correspond to ‘version 4’ above. Concerning the deletion of Lasker’s name from Kombinationen by Kurt Richter (1936 and 1940 editions), see C.N. 7875. Raymond Keene’s presentation of the game (The Times, 4 February 1995, page 10) is shown in Cuttings. A noteworthy addition is that in 1933 Lasker played the game with the black pieces. 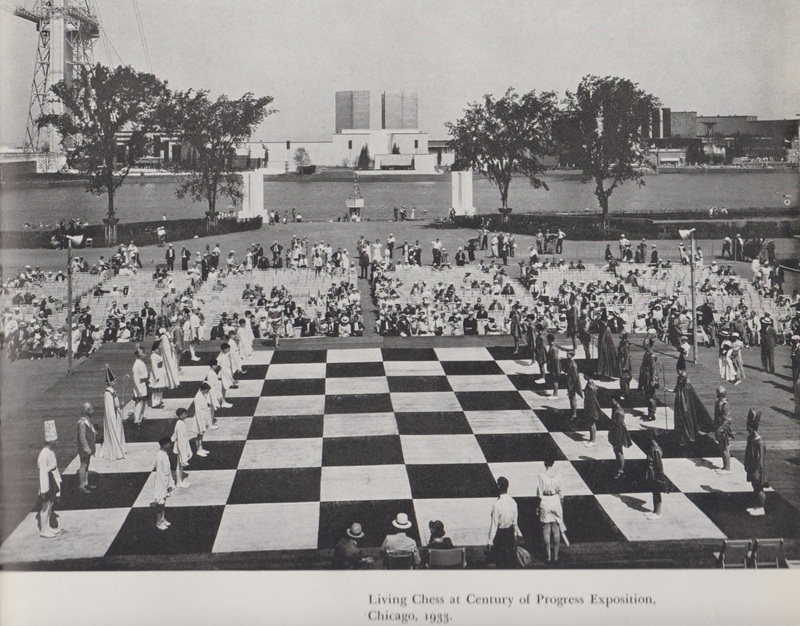 ‘In a chapter on eccentricities of the game, Liddell’s book [Chessmen by Donald M. Liddell (New York, 1937)] brings a picture of a board with living pieces used in a game played in the open-air amphitheater of the Century of Progress Exposition at Chicago, in 1933. I happened to direct that game, and the picture recalled to my mind a tragicomic incident which occurred toward the end of it. The chess pieces were mostly boys and girls from Chicago high schools, dressed in real old-Indian costumes. On the day of the game a bright, hot sun was shining, and over 5,000 onlookers crowded every available spot in the arena. To the majestic tune of a march especially composed for the occasion by the well-known composer DeLamarter, who was a resident of Chicago, the chess pieces, in impressive array, descended a wide stairway and took their places on the board. The world champion, Alekhine, had been engaged for the occasion to play the game with me which the living pieces were to show, and a tower was provided from which Alekhine and I called our moves through megaphones. To make sure that the performance would not take more than an hour at most, we had decided to select a short game with which we were both familiar, rather than actually engaging in a contest ourselves. The choice of the committee had fallen on a rather well-known game which I had won some 20 years previously against the British champion, Sir George Thomas. Alekhine agreed, but insisted that he should play the winning side. Everything went fine for about a half hour, when suddenly my queen’s rook’s pawn fainted. The poor fellow had been standing motionless in the hot sun all that time, and instead of making it known to someone that he was feeling ill, he held out bravely until he finally collapsed. He was carried out on a stretcher and replaced by an “understudy” whom we had held in readiness in case one of the actors did not show up. Sosonko has yet to specify his source for Thomas’ remark, and to explain how the issue of resignation arises in a game which ended in mate. The game was dated 1921 on pages 169 and 185 L’oeil tactique: l’entraînement à la combinaison by Emmanuel Neiman (Paris, 2003). 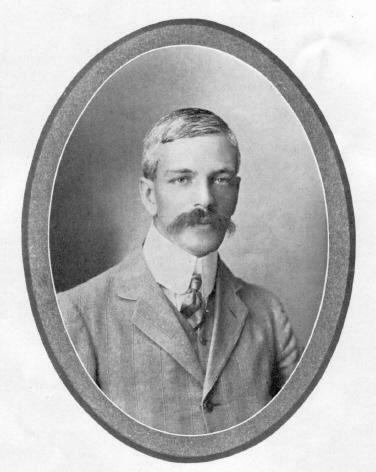 For information about George Thomas’ birth in 1881 and his inheritance of the baronetcy in 1918, see C.N. 10680. Source: Schachjahrbuch für 1915/16 by Ludwig Bachmann (Ansbach, 1917), pages 61-62. 1 d4 f5 2 e4 fxe4 3 Nc3 Nf6 4 f3 exf3 5 Nxf3 e6 6 Bg5 Be7 7 Bd3 O-O 8 O-O b6 9 Ne5 Bb7 10 Bxf6 Bxf6 11 Bxh7+ Kxh7 12 Qh5+ Kg8 13 Ng6 Re8 14 Qh8+ Kf7 15 Ne5+ Ke7 16 Qxg7+ Bxg7 17 Rf7+ Kd6 18 Nb5+ Kd5 19 c4+ Ke4 20 Re1 mate.